Swiss | WHY DO WE LOVE CHOCOLATE? – The products – these have developed over time but always have satisfied a sweet tooth. – The customers – although they have changed, they have always stayed the same, pastry chefs and, more recently, also confectioners. – The pursuit of the new – the company founder, his son and today’s management have always believed in innovation and have always been ahead of their time. -The unorthodox mindset – Felchlin’s management cared little for convention but looked for new approaches in order to arrive at different solutions. In 1908, during the “Belle Epoque” period, 25-year-old Max Felchlin from Schwyz opened a shop. 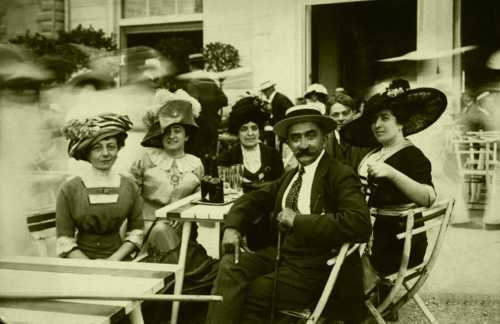 This timewhen women wore large hats and wide skirts and men sported carefully twirled moustaches and fine cloth. Felchlin sold honey and also made spread for bread that was aptly named “Ambrosia”. He spoke German and Swiss German and was also fluent in French and Italian. He was qualified merchant with boundless energy and had inherited his business acumen from his mother who, widowed at a young age, ran first a distillery and then a trading business. A time of change At that time, Schwyz was in a state of transition: the new postal building near the main square had just caused a stir, Zeppelin and other pioneers of aviation were launching airships that generated ripples both in skies and amongst the onlookers below. It is not surprising that the young, multi-talented Max Felchlin wanted to take his fate into his own hands. It was in his nature to try different things: he became chairman of the Mythen mountaineering club, was a passionate skier, sold typewriters, took lots of photographs and wanted to train as a photographer in Berlin. Hoever, his trip to the German capital was of short duration and, after returning to Schwyz, he founded the Kaufmännischer Verein and became head of the Kaufmännische Berufsshule. This chopping and changing from one thing to another all came to an end in 1913 when Felchlin set up the “Honigzentrale Schwyz”. He took on two permanent employees, thus demonstrating his decision to dedicate himself to this line of business. The young company went from strength to strength. Felhlin perfected “Ambrosia”, the spread made of honey, butter and fat – known locally as “Luussalbi”. He became an adroit trader in honey; during the First World War when the honey trade had all but collapsed, Felchlin seized every favourable opportunity to import Italian, Dutch and American honey and went on to sell this not only in Switzerland but in other countries, too. As soon as the borders for both honey and people had reopened after the war, Felchlin embarked upon a fact-finding mission to America. In 1920, he visited honey suppliers, trading centres and a centre for the breeding of queen bees. He learnt all about the latest technologies. In 1922, back in Schwyz, Felchlin started to produce artificila honey. He also gradually expanded his product range. It became increasingly clear that his most important customers were bakers and pastry chefs, whom Felchlin supplied with semi-finished products. He sold baking powder, Vanilla-flavoured cream powder and even pure chocolate (“Cacao Couverture Cacaobutter”). This was quite remarkable. At the beginning of 1920s, Switzerland had hit rock bottom economically; it was shaken by strikes, foot and mouth disease was threatening agriculture, and it was at precisely this time that Felchlin decided to stake everything on chocolate, a luxury product. Once again, this demontrated his canny nose for business. Sure enough, the situation started to improve and Felchlin had made the right decision as Switzerland entered the Golden Twenties. As it was too complicated for pastry chefs and bakers to make chocolate themselves, Felchlin’s couverture was just the right product at just the right time. People danced the Charleston, wore short flapper dresses and sported Eton crops, watched with awe as high-performance racing cars sped through the mountains, discovered the cinema and the music halls – and added a little sweetness to their new way of life. Felchlin was the first to offer chocolate couverture to pastry chefs. He also sold almonds, hazelnuts, sultanas, currants, coconut, figs, candied orange peel, egg white, malt extract, baker’s ammonia, baking soda, sodium silicate, spices, pear-bread and gingerbread spices and fruit essences. 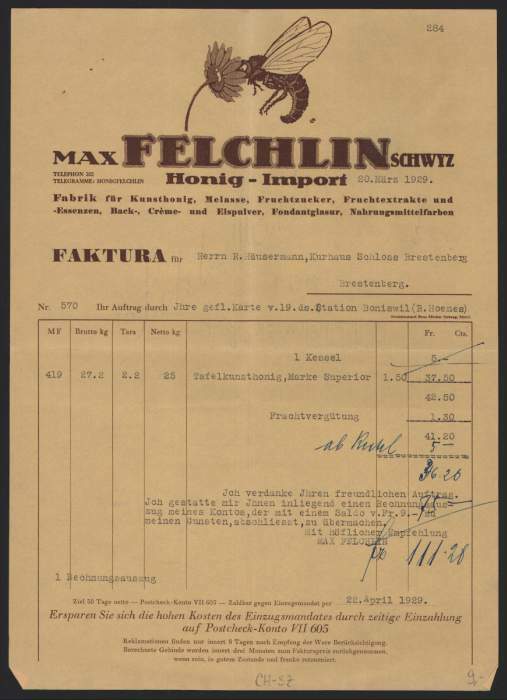 As the name Honigzentrale did not properly reflect this impressive range of products, the company was renamed “Max Felchlin, Schwyz, Spezialhaus für den Konditoreibedarf”. Work in the laboratory History is not doubt that Max Felchlin was a resourceful businessman. However, he was more than just someone who was fortunate enough to have a few lucky breaks. In 1928, he set up his headquarters and home in Liebwylen. His laboratory was located directly below the office and this was where he experimented with new recipes until late in the night. The French novelist Victor Hugo once said, “Genius is about patience”. Felchlin liked to quote him and certainly lived up to spiret these words. He was dogged in developing both his products and company; his personal development was also remarkable. By the time he had reached middle age, Felchlin was an established businessman. He had a flourishing business, a beautiful home and office, a capable wife and three children. Thanks to his foresight, he had successfully achieved a clever mix of continuity and innovation. He confidently steered his company through stormy times, such as the world economic crises and the Second World War. At a propitious time, he purchased such vast quantities of sugar that the beams of the warehouse bowed under its weight. He developed the “Pralinosa” praline filling and the “Sowiso” cream powder. The extent of the popularity of “Sowiso” was largely due to fact that the next generation had a part in its succes: the youngest son of the family, Max Johannes, born in 1923, took the lead in selling “Sowiso”. He used his remendous wealt of ideas to market the cream powder that, with or without cookin, introduced fine vanilla, chocolate and caramel creams into domestic households. However, it was decades before Felchlin could hand business over the next generation. As is so often the case in companies managed by founder and owner, Max Felchlin senior initially despaired of his son. He finally handed over the reins to 39-year-old Max Felchlin junior in 1962 when he had proven himself by working at companies in Switzerland and the USA. A marketing heavyweight First and foremost, Max Felchlin senior was a manufacturer who did his daily rounds of the factory and was actively involved in the production process. His son, on the other hand, was a marketing man who never spent any time in the production; he had products manufactured to meet the demands of the market. Despite this diffrence, they had one important thing in common: they were independent – and wanted to remain so. Although the Schwyz region was Catholic through and trrough, Felchlin senior was a freemason; Felchlin junior was an untameable free spirit. He celebrated his independence by taking off on numerous study trips abroad. In January 1962, he took over the directorship of the company and, in the summer of that year, spent three months studying at the Harverd Graduate School of Business Administration in Boston. The company continued to flourish in Schwyz, mainly thanks to the established management team with Robert Lumpert (finance, sales), Felix Lappert (development, production) and Lilly Volpi (purchasing). Speaking of his extensive travels, Max Felchlin joked: “My company never does better than when I’m away.” This was meant aa a compliment to his executive employees. Perhaps Felchlin needed the freedom afforded him by his travels to Chili, India, Italy and the USA to continue to supply his tremendous wealt of ideas. On thing is certain: when abroad he always looked for new sales markets for his products. An extended trip to Japan opened up a new market there that soon became the most important export destination for Felchlin products. Whichever way you look at it, Max Felchlin was an unconventional company director. He once asked his employees about their hobbies. He urged those who did not have any to take one up. He believed it was important that his employees had something else in life apart from work and that, should the need arise, they would be able to find solace in this is something bad were to happen to them. He also believed in emplyee training. In fact, so committed to this was he that his head of finance, Robert Lumpert, once asked teasingly, ‘What is actually the purpose of our company: to train employees or to generate profits?” Max Felchlin even wrote vocational training brochures entitled “Werni Wild wird Beck-Konditor”, thus demonstrating his talent for making less attractive areas seem more appealing to specific target groups. He was a talented marketing man. He had a quatation from Goethe mounted above the entrance to the company headquarters: “The spirit out of which we act is the highest.” However, Max Felchlin did not always displays this fine spirit himself: he could be very loud and overbearing. He burst into offices, forcing people who were talkng on the telephone to put down the receiver because he had something to say to them. If he didn’t like someone, he made it quite obvious, once he had made up his mind, there was no changing it. On the other hand, he was both loyal and generous to those people he held in high esteem. There is no doubt that Max Felchlin had a complex personality. He was an enigmatic figure: eccentric, with a touch of genius. His never-ending wealth of ideas was of tremendous benefit to the company. As competition increased and the domestic market became smaller, brilliant ideas were required and it was necessary to open new markets. In Swizerland, Felchlin tool pains to develop relationships with pastry chefs but was unsuccessful in this. However, he strengthened realtionships with wholesalers and the food service industry and cultivated commercial customers with sales promotions. He also developed the world-wide export side of the business; Felchlin headed the export department, after all, he was the most widely-travelled person in the company. He opened up the markets in America and Japan, accompanied by his American wife, Suzanne Felchlin-Eppes. Felchlin acted with foresight and, in 1963, purchased a large area ol land in Ibach. In 1964, he opened a new warehouse on this land and, ten years later, it became the manufacturing site for all non-chocolate products. Nevertheless, however well-versed in the ways of the world, Max Felchlin kept his feet firmly on the ground and remained true to his roots. He commissioned a historian to research the history of the Felchlin family in the Middle Ages. He had a strong interest in local traditions, which he encouraged as well as he could. He supported the “Chlefelen”, a type of Swiss castanet, as well as the “Geissechlepfe”, the crack of the whip, by financing courses and offering prizes. Felchlin not only researched but also promoted, with a scientific meticulousness, “Trentnen”, the almost forgotten card game from Muotathal. New training centre Since training was a subject so close to his heart, in the warehouse where the “Sowiso” cream powder was manufactured, Felchlin established “Condirama”, the industry’s first training centre for pastry chefs and confectioners; this became an outstanding customerloyalty tool. At the opening in 1987, Max Felchlin again showed his unconventional side by dressing up as a radio reporter in order to find out what the public really thought of the new venture. Felchlin was just as singular when choosing a successor. In 1990, he founded the “Verein zur Förderung der Wirtschaft und des Kulturschaffens” (an association to promote the economy and cultural works), issuing the majority of votes to Max Felchlin AG and thus separating capital and decision-making authority. Since then, the company has experienced a very positive development. Max Felchlin appointed Christian Aschwanden as his successor; a food engineer and former Lindt manager, Aschwanden is a specialist in his field and, born in Schwyz, also completely conversant with local customs. 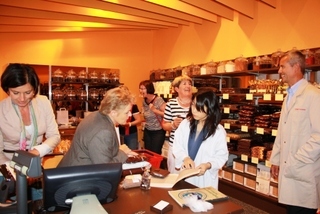 Condirama in Schwyz is a training centre for confectioners and pastry chefs. “We wish to earn money by providing services – freely, honestly, cheerfully and optimistically,” Max Felchlin remained true to this belief until his death in 1992. However, his successor had a long way to go before he could even start to think about making money again. The economy faltered, fey customers bailed out, small customers had to fight to survive and, in the midst of all this, the cantonal authorities for food control threatened to shut down chocolate production because it was housed in a simple wooden building in Seewen. The company was in the red. New strategy In two closed meetings, the company management under Christian Aschwanden decided to tackle the problem head on. After all, previous company directors had demonstrated tremendous reserves of strength and the new management endeavoured to reinforce and develop the strengths of both production and sales. Management became a powerful team of specialists who knew how best to employ their strengths. By means of clever marketing, it was possible to win back customers and the new management also finally succeeded in securing a foothold with confectioners. Furthermore, production was made as flexible as possible, and this set Felchlin apart from larger suppliers. Finally, the most important step was the decision to concentrate production on high-quality goods. Felchlin wanted to control production quality from start to finish. This meant selection cocoa at source, transporting it over long distances and processing it with tremendous care. In 1999, in order to underline the high quality claim and standard, this fine flavour chocolate was named “Grand Cru”. One year later, the new factory was built on the plotof land bought by Max Felchlin in Ibach and this became the manufacturing site for all products. The success of new strategy was not long in coming. Customers were delighted and, in 2004, so was the strict jury: at the blindtasting of the famous “Accademia Maestri Pasticceri Italiani”, “Maracaibo Clasificado 65%” was crowned the best fine flavour chocolate in the world – a great honour for the chocolatiers from Schwyz! This succes was all the sweeter in view of fact that Felchlin hadn’t even entered the chocolate in the competition in the first place; the Italian importer had seen to that. Fechlin thus built on the succes of a previous award; at a blind tasting by bakers and pastry chefs in 1968, the outstanding qualities of dark couverture from Schwyz secured it first prize in the overall ranking ! Whereas Max Felchlin senior’s unconventional nature manifested itself in trying out new recipes, Max Felchlin junior was a man of unusual actions who liked to push through original ideas. Today, the unconventional is firmly anchored in the company strategy. Felchlin is not interested in compromise and believes in high quality in all stages of production, always translating its beliefs into actions. Customers appreciate this; they know where they are with Felchlin. As in the early days of the comapny, the majority of Swiss customers are still small traders and products are still predominantly semi-finished goods for confectionery and bakery products. Today, 104 years since the foundations of the company, people no longer wear crinolines and sport twirled moustaches. Howevern they still love the exquisite confectionery that is produced using Max Felchlin AG products – and today they also benefit from the added experience and expertise that has been developed over the last 100 years !